The Dance of Death. 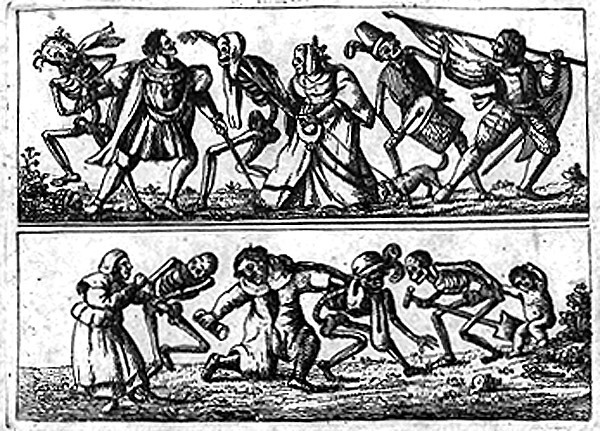 Die Totentanz: A German-language site spotlighting, for example, the dance of death in literature, graphic art, music and film. For those, like me, whose German is not so good, this page offers an English-language history of the phenomenon, and the Catholic Encyclopedia has an article too. See also Holbein's Dance-of-Death; Lübeck's Dance-of-Death; and umm, this. While this list dutifully notes the dance of death scene from Bergman's The Seventh Seal, it neglects completely a similar scene from the Monty Python oeuvre. Oops, apologies: when I said not so good, I meant virtually non-existent. This is really good. Thanks again misteraitch. The Verzeichnis der musikalischen Totentänze failed to list one of my all-time favorites, "Don't Fear the Reaper" by Blue Oyster Cult. mr_roboto: Also left out is the sublime parody of Bergman in "Bill & Ted's Bogus Journey". 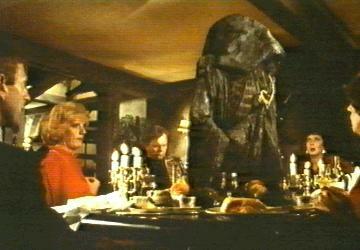 On the literary front, Poe's Masque of the Red Death is a notable addition to the canon of Death-dances. Less notable than Poe, but certainly more recent, Reginald Hill's Death's Jest-Book (a nod to the bizarre closet drama of the same name by Thomas Lovell Beddoes) is organized as a Dance of Death. Excellent, excellent post, misteraitch, and I am a fan of your wonderful blog too. Thanks! Thanks for the links, misteraitch.